View of “Loris Gréaud,” 2015. Loris Gréaud is best known for expansive multimedia installations concerning grand themes often culled from the natural sciences. Executed in collaboration with architects, engineers, and physicists, the sculptural components of his immersive environments reference the firmament and biological forms. Gréaud set up the entire gallery as a fictional civilization’s natural history museum, titled The Unplayed Notes Museum, 2015, which was then attacked and partially destroyed by actors, as directed by the artist, during the opening night performance. This staged act can be seen as mimicry of humanity’s maniacal covetousness for pillaging and reconstructing the past through cultural artifacts, as well as a futuristic allusion to the ruins of our species after apocalyptic realities unfold. Through vast rooms the viewer walks among displays that include glossy black abstract paintings—many torn from the walls and smashed—redolent of cave markings, a mutated herd of polyester foam animals, clouds of silvery flickering lights made from hourglass sand, and fossilized tablets. Wall labels in each room are intentionally indecipherable, functioning as collective props to a larger exposition. 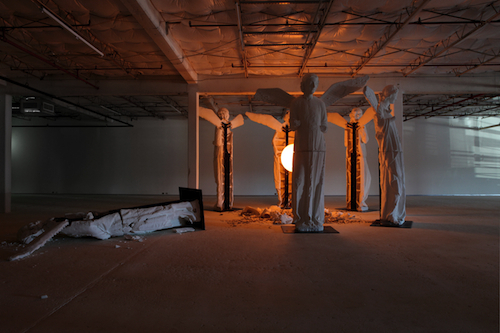 In one room an imposing circle of angels, one flung facedown on the floor, towers sinisterly. Illuminated by a lurid orange orb in the center of their arrangement, the statues are like those monumental remnants at the heart of mysterious cultures in sci-fi films, such as 2001: A Space Odyssey or Prometheus. Elsewhere, a video showing a couple mid-coitus is shot with a thermal-imaging camera, giving the protagonists an eerie, alien-esque appearance. A spare, thunderous musical sound track throughout the exhibition also suggests distance while furthering the notion that the viewer is witnessing the ghosts of epic events that are familiar, but long gone.